The Centre for the Humanities at Utrecht University and the Syracuse University Humanities Centre, in collaboration with the Slought Foundation and Treaty of Utrecht Foundation present: grand opening of the Perpetual Peace Symposium & Exhibition, October 13, 2011. More information at uu.nl and perpetualpeaceproject.org. 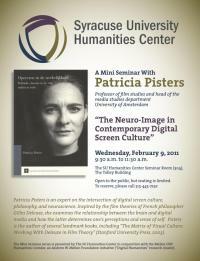 Patricia Pisters is an expert on the intersection of digital screen culture, philosophy, and neuroscience. Inspired by the film theories of French philosopher Gilles Deleuze, she examines the relationship between the brain and digital media and how the latter determines one’s perceptions and sense of self. Pisters is the author of several landmark books, including “The Matrix of Visual Culture: Working With Deleuze in Film Theory” (Stanford University Press, 2003). The Mini Seminar series is presented by The SU Humanities Center in conjunction with the Mellon CNY Humanities Corridor, an Andrew W. Mellon Foundation initiative (“Digital Humanities” research cluster).